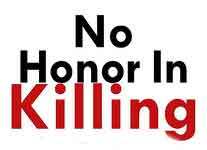 According to a respected womens’ activist Tahira Abdullah she suspects that there is a strong possibility of an honor killing on Thursday morning in Quetta. The issue is about a family dispute regarding a court marriage of Akhtar Hussain and Haseena Bibi. Both have gone through an own-choice marriage and is being challenged by a counter-case by their family members in a counter case. Haseena is in Dar-ul-Aman, Quetta while Akhtar Hussain has recently been released on bail from prison, the couple fear that they will be killed en-route to or from the court and they have urgently requested for protection & security. Tahira Abdullah draws the attention of civil society activists, womens organizations and media outlets in Pakistan and across the world to draw immediate attention to this issue, if enough eyes are on this case there is a strong possibility that the culprits would hesitate before committing this heinous crime while I think we must also draw attention of the Government of Pakistan to provide protection and security for the couple with immediate effect. Huqooq March ends today on 8th March with public gathering in Gandakha participated by thousands of men and women. Huqooq March started by Awami Party on March 1st to support election campaign of Mai Jori, a peasant woman contesting election of provincial assembly of Balochistan. The marchers arrived in Gandakha today that was received by hundreds of men and women as they marched into the streets of Gandakha. Addressing the public gathering Mai said that her election contest is the overwhelming decision of peasants, women and youth of the area. She was least worried about the election result and promised to continue struggling for the poor for their rights fighting against the big landlords and influential people who in a cowardice attempt use the government resources to influence the election. Mai Jori continues her eight day Huqooq March by going walking through the various villages and towns in her constituency to rally up support for her by-election bid, but more importantly she is the symbol of hope for the down trodden and suppressed women of that area. throughout her journey she is being greeted by many peasants who greet her to a resounding welcome everywhere she goes. On the third day (March 3rd) of Huqooq March she and her fellow marchers traversed through the village “Bagh Tail” by marching 30km through a convoy of motor bikes, hitching rides from various datsun pick ups, buses, cars and tractor trolleys. The marchers were well received by the villagers at Bagh Tail who literally came out in droves to greet her. Addressing the marchers and villagers gathered to receive her, Mai Jori resolved to continue lobbying for the rights of poor and vulnerable especially women regardless of the outcome of her election result. This Friday a few offroad enthusiasts headed off to Hingol National Park deep within Baluchistan some 280km from Karachi, reaching Aghore Camp we then dropped off the metaled Coastal Highway and headed into total offroading wilderness going up north some 40-odd km to a location called Poldat. Poldat is a natural mountainous gorge which is the passageway of the Hingol river from the north to the south, many of Hingol’s tributaries aggregate ahead of this region and pass through this natural gorge to finally dump into the Arabian Sea. In all likelihood this mountainous passageway cannot be traversed by any vehicle and hence the offroaders took this up as a challenge to try and reach this remote destination. We were able to drive up to about a kilometer short of Poldat and trekked the rest of the way up. Mai Jori, a peasant women contesting the Baluchistan Assembly by-elections has embarked upon an eight day Huqooq March (March for Rights) journey across her constituency by foot rallying voters to stand up for their rights and be a part of the change. Mai Jori started on the 1st of March from the village Ghulam Muhammad Jamali to Gandakha and visited several villages on the way and will continue to march across the region till the 8th of March. Men and women of the area joined this March for Rights in hundreds. Mai Jori Jamali a peasant farmer belonging to a village called Ghulam Muhammad Jamali in Baluchistan filed to contest the bye-election on the vacant seat of Baluchistan Assembly PB 25 Jaffarabad – I on March 10th 2010. Her papers have been accepted and declared correct after scrutiny. Mai Jori is illiterate and helps her husband in farming she also looks after her nine children. She brings water for the family after traveling 2 km distance and was shot into prominence in 1978 due to Pat Feeder Kisan movement when progressive and trade unions leaders had started living in the Goth area for the sake of movement. Mai Jori is contesting from the area which was recently brought into focus for the infamous and heinous crime against women where a few women were buried alive in 2008 in a case of Honor Killing. Mai Jori Jamali is contesting election on party ticket of Awami Party Pakistan. It is being reported that Mai Jori and her relatives have taken this decision to dare to fight with outdated customs of women brutality in the region. As part of yet another offroad expedition the Offroad Pakistan group headed to the Sorh Valley in Baluchistan to enjoy the challenges that the terrain could throw at our vehicles. A group of about 40-odd enthusiasts packed themselves in 17-odd offroading vehicles started this adventure on Friday morning and headed to Sorh, Baluchistan in the region of Bhootani Farms to return late Sunday night. Faisal Kapadia of Deadpanthoughts accompanied us on this adventure trip.